LONDON (Sporting Alert) — English Premier League results and standings heading into Monday night’s clash between Arsenal and Swansea City at Emirates Stadium. Filed Under: Premier League Table, Soccer News Tagged With: Premier League, premier league scores, Sports News, West Ham United F.C. 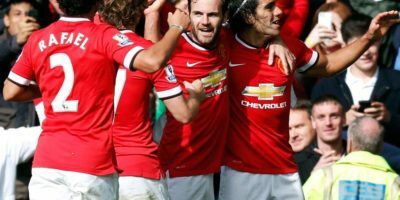 LONDON (Sporting Alert) — Live text commentary and live score updates from the English Premier League game between West Ham United and Manchester United at Upton Park. Filed Under: Soccer News Tagged With: Louis van Gaal, manchester united, Premier League, robin van persie, Sports News, West Ham United F.C. LONDON (Sporting Alert) — The following are the English Barclays Premier League games taking place this weekend. MANCHESTER (Sporting Alert) — Manchester City easily defeated West Ham United 2-0 in the final game of the season to lift the English Premier League on Sunday. The accomplishment on Sunday saw Man City winning the EPL title for the second time in three years. Filed Under: Soccer News Tagged With: Alert, English Barclays Premier League, joe hart, liverpool fc, manchester city news, manuel pellegrini, Premier League, West Ham United F.C. LONDON (Sporting Alert) — The following is the list of games on the final day of action in the 2013-14 English Barclays Premier League on Sunday. Below is the live streaming information and link for the TV channels streaming these games on Sunday. Filed Under: Soccer News Tagged With: English Barclays Premier League, liverpool fc, manchester city news, manuel pellegrini, Premier League, West Ham United F.C. LONDON (Sporting Alert) – English Premier League points standings heading into the fins set of fixtures on Sunday May 11. Filed Under: Soccer News Tagged With: Alert, manchester city news, manchester united, Premier League, West Ham United F.C. LONDON (Sporting Alert) — Here are the half-time scores in the English Barclays Premier League on Saturday. Four games are currently underway with the clash between Southampton v Liverpool coming up later. Filed Under: Soccer News Tagged With: Premier League, premier league scores, West Ham United F.C. West Ham United manager Sam Allardyce made two changes from the side that was beaten in the last outing, while West Bromwich made six adjustments for today’s English Premier League clash. Filed Under: Soccer News Tagged With: Live Soccer Scores, Premier League, Sports News, West Ham United F.C. Arsenal manager Arsene Wenger makes one adjustment from the starting team that faced Chelsea on Monday for the Boxing Day clash with West Ham United. Filed Under: Soccer News Tagged With: Laurent Koscielny, Mathieu Flamini, Premier League, Santi Cazorla, Sports News, West Ham United F.C. Wayne Rooney returns and does starts for Manchester United in today’s English Premier League clash with West Ham United at Old Trafford. Follow Live Soccer Scores Here. Filed Under: Soccer News Tagged With: Live Soccer Scores, manchester united, Premier League, Wayne Rooney, West Ham United F.C. A red hot Luis Suarez is ready to duplicate his last goalscoring performance for Liverpool FC when the Reds take on West Ham United at Anfield Saturday. Filed Under: Soccer News Tagged With: liverpool fc, luis Suarez, Premier League, Sports News, West Ham United F.C.